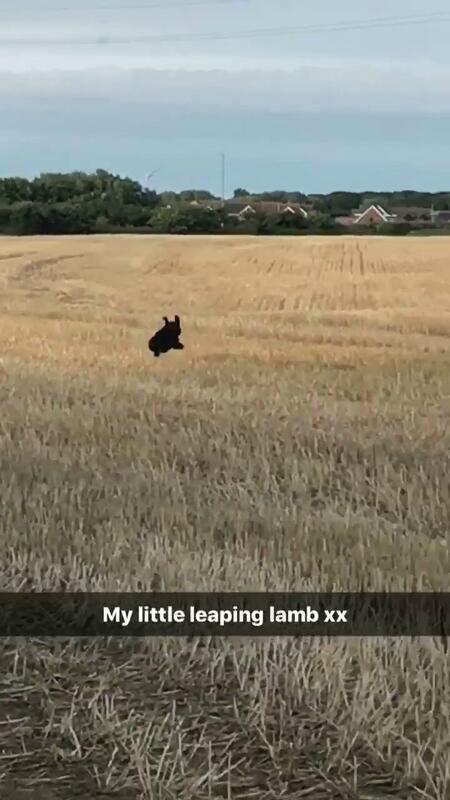 Account: Family were out in a field walking their dog; they took a video of their dog playing. 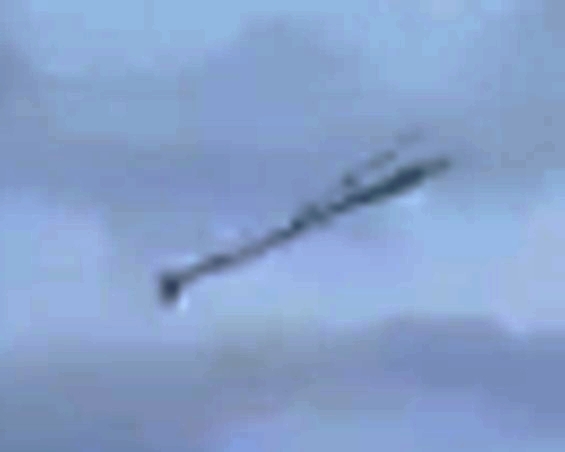 When they watched the video back, a large slim object was clearly visible. Nothing untoward seen at the time. Clearly, this seems to be yet another example of the camera seeing something that the eye cannot. 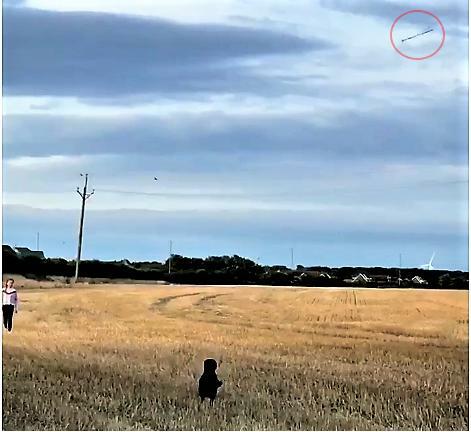 Interestingly, as well as the 'rod' UFO there appears to be something else stationary in the sky, (visible on the recording at up to approx. 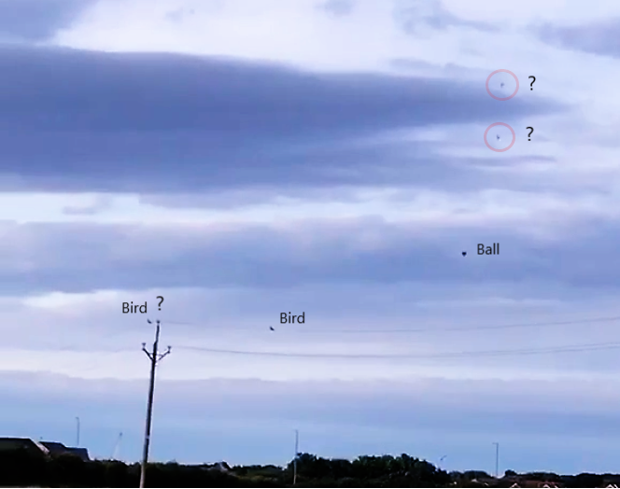 20 secs) top-left, in-line with the telephone wires... but difficult to analyze properly. Additionally, this footage has “hidden” movement within! Clearly, by its movement alone, this object is able to defy certain laws of physics! 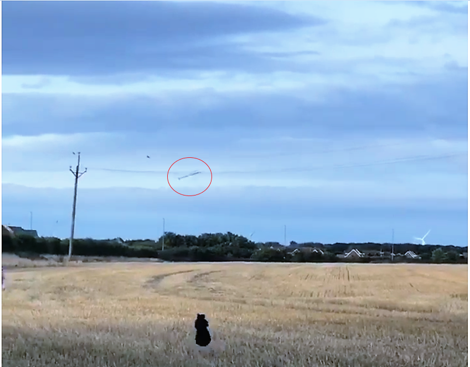 We also noticed a few other aerial anomalies which made an appearance on the recording, after the Rod apparently 'crashes' into the ground. Birds? Or Orbs/UFO’s? Personally, I think they are ‘orbs’ as they appear then disappear from shot immediately after passing the frame. (So, probably not birds as they would have remained in view somewhere in further frames). The following suggestion sounds a bit like something out of ‘Star wars,’ but... Could this rod object have been terminated, or possibly brought down and being observed by the two orbs I wonder? 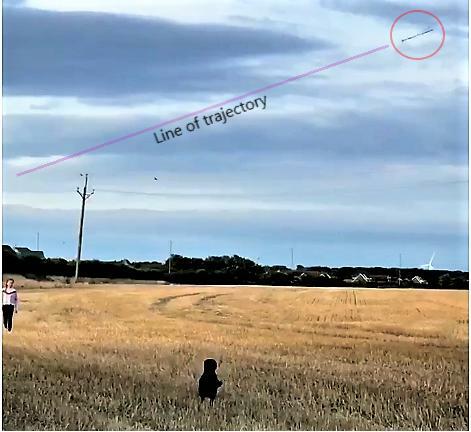 The curve of the “rod” suggests it is being pulled towards the ground by gravity ~ hence the reason for it’s unusual curved trajectory. After years of investigation, our proposed explanation for this type of phenomena is, that these types of UFO, (these objects, creatures, or whatever they might be) exist in a different spectrum of our reality and can often only be seen under certain circumstances. So, moral to the story is - don't simply wait for UFO phenomena to appear - go freestyle with your camera... go 'sky fishing', as we do... you might just get a 'nibble. Daily, our dedicated team of investigators, (The BEAMS UFO 'Observer Corps' as we once nicknamed ourselves) are training their cameras on the skies, often randomly taking pictures and footage, even when nothing unusual is visible, in the hope that something might be captured; mostly it's disappointing though, especially when nothing worthwhile is secured, but then unexpectedly, one of our 'hunters' gets that 'eureka' moment!... bang, gotcha, another UFO in the bag, shot only with camera power. It's all down to trial and error, but what have we/you got to lose? This is a great and pioneering experiment, something we recommend that everyone should regularly try... and persist with. Who knows, you may already be sitting on a UFO image or two! Here at BEAMS, judging from how we are often sent old newly 'found' material, (new/old as we call it... be that from just a few weeks, months or even years ago) that many people may have already inadvertently captured strange phenomena on their camera without them even giving it a second glance. 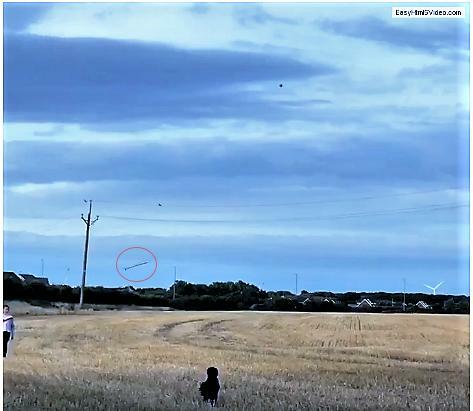 So, when you have a spare moment, please have a check through your old snaps and footage - that dark speck in the sky or wherever, may not merely be a bird or a bug etc as you might have previously assumed; why not enlarge that section just to make sure it isn't something possibly more exotic? and if you do come across anything a bit 'odd' on your phone or in your album, no matter how vintage, then please do forward your material to BEAMS for us to analyze... we might even publish them. Naturally, we will keep all submissions anonymous; and we can even pixelate faces for you as well if required for further privacy, should they be family photos and such like. You never know what undiscovered UFOs you may have lurking in your own home photo archives!